Readers of this blog will recall that in 2017, the People’s Tribunal on Human Rights and Environmental Justice Impacts of Fracked Gas Infrastructure held a hearing in Charlottesville, Va. The event served to highlight the environmental injustices of a massive compressor station proposed in the largely black community of Union Hill, in Buckingham County, and to tie this project to the larger issues of systemic and ongoing racism that was so horrifically evident in our community just a few months prior. In addition to testimonies from Union Hill residents and others directly impacted by proposed and existing fracked-gas pipelines and wells, the hearing featured renowned activist Lois Gibbs, environmental attorney and toxicologist Adrienne Hollis and anthropologist of indigenous and environmental justice James Igoe. The event was largely the result of efforts by Charlottesville-based anthropologist Lakshmi Fjord, who remains a stalwart ally of the Union Hill community. This was one of many similar events around the globe that are shining a bright light on the myriad health, economic and environmental harms wrought by fracking operations on communities, most often marginalized and disenfranchised. Their call for justice continues to be heard. The following is an open letter from Thomas Kerns, a professor at North Seattle College in Washington and a member of the steering group for the Permanent Peoples’ Tribunal Session on Human Rights, Fracking and Climate Change. 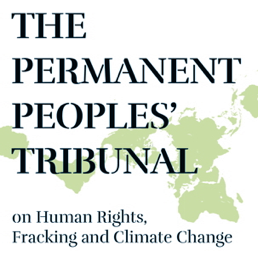 The Permanent Peoples’ Tribunal has just released its Advisory Opinion, recommending a worldwide ban on hydraulic fracturing, the extreme oil and gas extraction technique known as ‘fracking.’ The materials, and infrastructure of fracking inherently and necessarily violate human rights, the court decided in a Special Session on Human Rights, Fracking and Climate Change. The rights violated include the rights to life, to water, to full information and participation, and especially the rights of indigenous people, women and children. Governments have an affirmative obligation to protect the rights of their citizens, according to internationally recognized human-rights Covenants and Declarations. When governments fail to adequately regulate harmful oil and gas industry practices, they fail to meet their human rights obligations. And when governments fail to take measures to prevent the advance of climate change and its impacts on the rights to life, liberty, and security, they are failing to meet their internationally recognized human-rights obligations. Widespread government failures have created a global “axis of betrayal,” according to the international court, in which governments and fossil-fuel industries collude – at great cost to people and the planet – in human-rights violations to their mutual profit. The Special Session was conducted for five days in May of 2018. Four Preliminary tribunals had been conducted in the months prior to the Plenary hearings. The Pre-tribunals included rich oral testimony from Australia, the US states of Ohio and Virginia, and other places, supporting documentation, and findings from those Pre-tribunal’s local judges. All materials and reports from those Pre-tribunal hearings, all the Plenary session’s oral testimony and arguments, all Plenary session reports, amicus curiae briefs and full documentation are available, in both video and text formats, on the website for the Permanent Peoples’ Tribunal Session on Human Rights, Fracking and Climate Change. 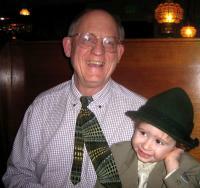 Dr. Thomas Kerns (photo from North Seattle College website. PS: And one more treat today: Kathleen Dean Moore’s reflections, recorded right after the conclusion of the Tribunal’s Plenary Session last May. You can hear, in Miranda Perrone’s interview with Kathleen, her remarks on the crucial importance of taking a human rights approach to climate change and fracking. Although not native to the region, Cat is deeply connected to the mountains, rivers, backroads and small towns of Appalachia she has come to know over the years. She is Appalachian Voices' Communications Director.